The title of this post is much shorter than the name of the book, but in fact the author provides a concise guide to all those things in an e book of less than fifty pages. Targeted for children in the early elementary grades and written in fairly simple language, this guide sets forth basic information combined with beautiful photographs. It can be a asset to the science section of the classroom as well as serve as a quick reference book or starting point for more research. The author might consider releasing a paper edition for libraries and print book lovers. Michaels begins with the planet’s history, characteristics, composition, and place in solar system. He next outlines the geographic regions of land and water and gives details about well known examples. The section on fun facts is sure to be a favorite among children; it provides a vast compendium of information in sentence form. For example, each winter approximately one septillion snow crystals drop from the sky or that 75% of the earth’s animals could be extinct within the next three hundred years. Michaels concludes with some ideas on how we can preserve the planet for our descendants. I have to admit that I learned quite a few things from this book. While I knew that most of the Earth’s surface is water, I was not aware that only 3% of the water on earth is fresh water. Did you know that the largest desert in the world is in Antarctica? Where can you find most of the Earth’s gold? How are mountains, volcanoes and rivers formed? 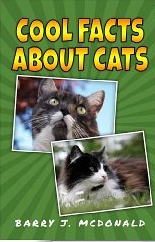 There are lots of surprises for adults as well as the children who pick up this book. 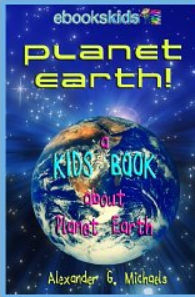 Take a look at this beautiful guide to our planet and share it with your children. Michaels has written a whole series of books, including one on the solar system, endangered species, and dinosaurs. I plan on taking a look at those as well. This book is billed as a travel guide for kids, but is just as useful for adults planning a trip to Walt Disney World in Florida. The author has really done a thorough job. She provides everything from the origination of the idea with Walt Disney and the history of the site to updates of most current information. There are maps and photos of street scenes, rides, restaurants, hotels and venues. The author advises the best way to negotiate the theme park as well as Epcot Center and how to find the fastest lines. Information on regulations, safety, and transportation is provided. Readers will learn about things like where to find the characters throughout the parks, lots of plans that were never carried out, and where to go to find the best entertainment, restaurants and hotels. Advantages and disadvantages of the resorts are laid out to compare and contrast. There is even an informal tour of the Disneyland Hollywood Studios and the Animal Kingdom. Schaefer teases us with lots of fun facts of which I was completely unaware. For example, did you know that the whole park is built over structures called utilidores? The actors and personnel can walk around freely underneath the park! The science fiction writer, Ray Bradbury, helped design and write the script for Spaceship Earth. No one visits the park without jumping on some of the famous rides so the author even provides a key to classifying them with the following code letters: S D T W or A. These letters stand for Scary, Dark Thrilling, Wet, and Awesome. The book is organized by the sections such as Magic Kingdom Park, Epcot, Movie Studio, Animal Kingdom. Entertainment, Special Tours, and Resorts. I can’t think of anything that has been left out. Near the end of the approximately one hundred twenty seven page guide is a list of Disney isms which explain its unique characteristics. Maps of the monorail and railroad are also included. Finally, the author writes a quiz to see how well you have been paying attention. She ends with last minute planning tips to remember before you embark on your trip. 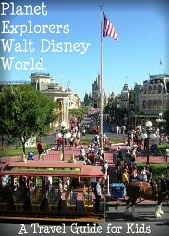 I have visited the Disney Park many times and still found so much I did not know about it in this guide. Some critics complain they would like to see it in book form, but I am very happy with this kindle version, which I will definitely review before my next trip to Disney World. Happy Travels! 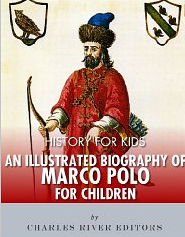 This is a most unusual book targeted for children nine and older. There are almost three hundred pages divided into six sections. If you expect a conventional book on food groups and good nutrition, you are not looking at the right choice. Some adults may find parts of it distasteful. 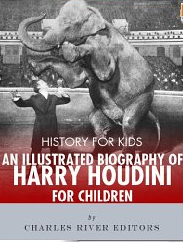 This volume does provide a lot of information written in a way that many children will enjoy and includes some very unconventional activities. . The book is available in hardcover and kindle editions. While the kindle version has nice pop up features, you will need a paper journal to complete activities. Basic premise of the book is to change the way you view food forever. Practical information is provided on how to deal with emergencies related to food like choking, poisoning, insect bites and first aid. It teaches how to set up balanced meals, use sustainable foods, and the methods of cooking and harvesting foods. There are diagrams showing the cuts of meat, and lessons on preserving foods, and how to forage, hunt and fish. An extensive glossary explains terms that will be unfamiliar to a child exploring the many topics included here. Probably the most unusual parts of this work are the mission or exploration sections. For example, in the balanced food section there is an activity to train yourself to eat foods you don’t like. Some suggestions are to take a given list of foods and record how they affect your breath, combine foods from several different countries, reverse the order in which you eat your daily meals, and make a graph comparing the number of calories people in different countries eat. Children are given different statements and asked whether they believe them to be fact or fiction. Some missions are rather conventional like planting herbs, flowers and bulbs. Others are truly unique like making chocolate poo and keeping a poo diary in the section on waste. The reader learns how to make a band of edible musical instruments, graph and eat his height in spaghetti and eat his words on sugar paper. Cooks in the kitchen learn how to make ginger beer monsters, bake cookies in the shape of countries and invent their own cheese by combining a few ingredients. I think by now you have a good idea of what this book is about. The content is somewhat rambling, but the work has a lot of value in the basic knowledge that it imports. 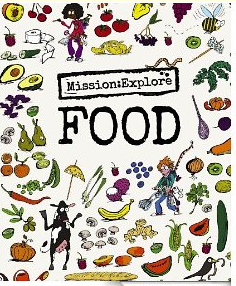 Even though some of the missions and activities may appear somewhat strange, most children will find an interest that they would like to explore. I feel that the book is most valuable as a reference tool on food nutrition, earth science, geography and environment. The author has written several books with the intent to inform the reader about animals and their environments. He writes well in an easy to read format that will appeal to both children and adults. Gorgeous pictures illustrate each of the major points. As is the case with previous books in the series, Don Juan covers every aspect of the arctic fox’s life. You will learn about appearance, feeding, geography, mating, behavior, habitat, predators, and dangers to humans. Near the end of this short sixty page book, the author provides a summary of fun facts with questions and answers. This makes the book perfect for a unit study or cooperative learning project in the classroom. Without giving away all the wonderful details that the author provides, I will provide a short summary about this amazing animal. The arctic fox ( Vulpes lagopus ) has many common names. These include polar fox, white fox, and snow fox. This animal lives in the alpine tundra or arctic regions. Despite its name, this animal is not always white. It is born a darker brown color which gradually becomes white over time, while in summer its color actually returns to brown providing camouflage. Its body is round and fat with short legs and a thick tail preventing loss of heat; adaptations that evolved over time so that it could survive in this harsh environment. The arctic fox preys on smaller animals, the lemming being its favorite when available. In spring it will attack baby ringed seals. Fish found beneath the ice are also a food staple. Arctic foxes live in caves or burrow in the sides of cliffs. They are generally monogamous and choose one lifelong mate. The mother’s litter of kits generally ranges from seven to fifteen. Their average life span is only three to four years. Polar bears are their biggest enemy, but wolves, snowy owls and humans also hunt them. They have keen senses especially in the area of smell and hearing. Arctic foxes carry diseases like rabies and encephalitis and may be affected by mercury poisoning from the fish that they eat. Readers will learn much more by studying in detail the text and photographs in this unique book. Just the thing to stretch your mind and remind you of the wonders and beauties of nature.